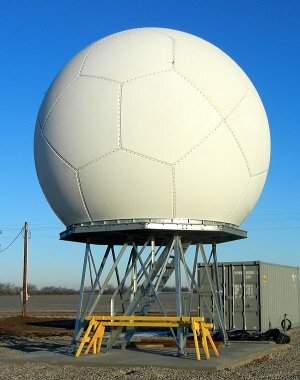 As part of the 2009 American Recovery and Reinvestment Act, ARM procured four C-band Scanning ARM Precipitation Radars (C-SAPRs). The C-SAPR is a polarimetric Doppler radar that operates in a simultaneous transmit and receive (STAR) mode, meaning that the transmit signal is split into two parts so that power is transmitted on both horizontal and vertical polarizations at the same time. The antenna is direct center feed parabolic dish reflector with a diameter of 2.4 m providing an antenna gain of 45.1 dBi The antenna is covered by a radome with a diameter of 3.7 m. The two-way radome loss is less than 1.0 dB. The Transmitter uses a 250 kW magnetron, this puts 125 kW of transmitted power for each polarization. The C-SAPR also has the ability to transmit on a single polarization (either horizontal or vertical) and measure linear depolarization ratio (LDR). The receiver for the C-SAPR is a National Center for Atmospheric Research (NCAR) -developed Hi-Q system operating in a coherent-on-receive mode. Its dynamic range is more than 80 dB, and its Noise figure is 2.8 dB. The analogue-to-digital converter (ADC) uses a sampling rate of 40 MHz. The ARM Climate Research Facility operates two C-SAPRs; one of them is deployed near the Southern Great Plains Central Facility (SGP) in Oklahoma, and the second C-SAPR is deployed at ARM's Tropical Western Pacific (TWP) site on Manus Island in Papua New Guinea.